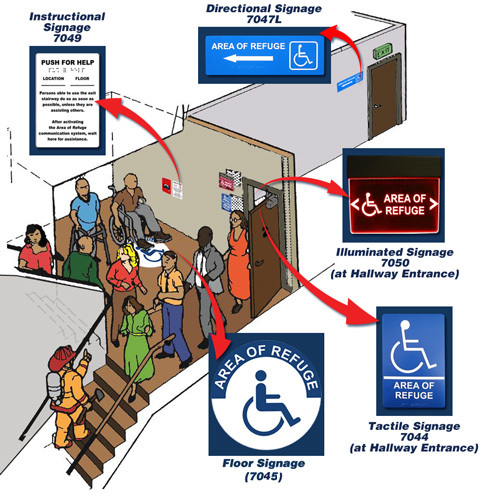 An Area of Refuge is a location in a building designed to hold occupants during a fire or other emergency when evacuation may not be safe or possible. These designated locations provide protection and safety until assistance or rescue is available. Code requirements state that proper signage must be visible to direct individuals to these safe locations. 1) Persons able to use the exit stairway do so as soon as possible, unless they are assisting others. 2) Information on planned availability of assistance in the use of stairs or supervised operation of elevators and how to summon such assistance. 3) Directions for use of the two-way communications system where provided.